Having just seen the photographs of the old Royal Observer Corps underground post at Billericay brought back memories. After 3 years in the RAF I spent 12 years in the Royal Observer corps at Billericay several of those as Leading Observer, in charge of training. We met in the Community Rooms in the High street and prior to the building of the underground post, carried out exercises in an above ground post in a field at Great Burstead. 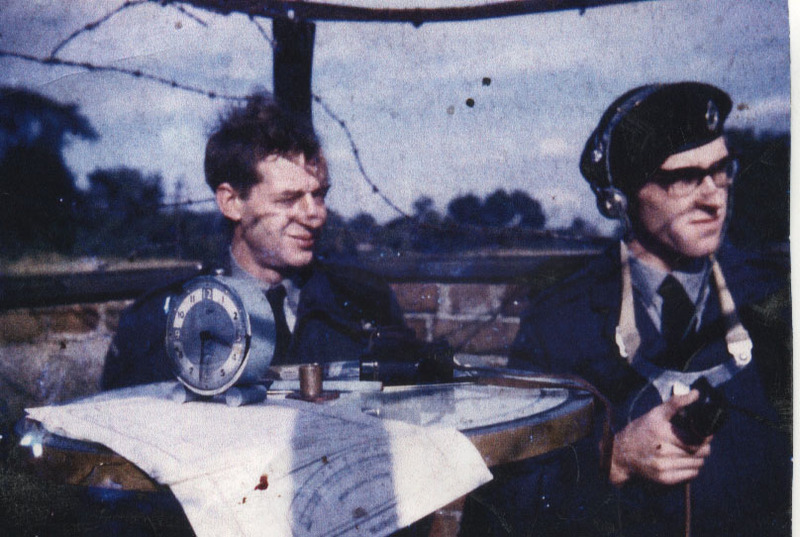 Jack Thornton and myself in the old above ground post with various charts, an alarm clock, a few strands of worn out barbed wire and a hopeful expression that we might spot an aircraft, identify it and report it to those who needed to know. In those earlier days we belonged to the RAF and aircraft recognition was the thing of the day. American aircraft from fairly local air bases would stage exercises when their jets would stooge along at low level then zoom at that same level above our (and no doubt other Observer corps posts) leaving shattered Observers desperately trying to identify them, what height they were flying at and their direction. All to be reported to the powers that be via an antiquated head and breast telephone set. Incidentally Billericay post was designated as P4……or Papa fower….using NATO parlance. 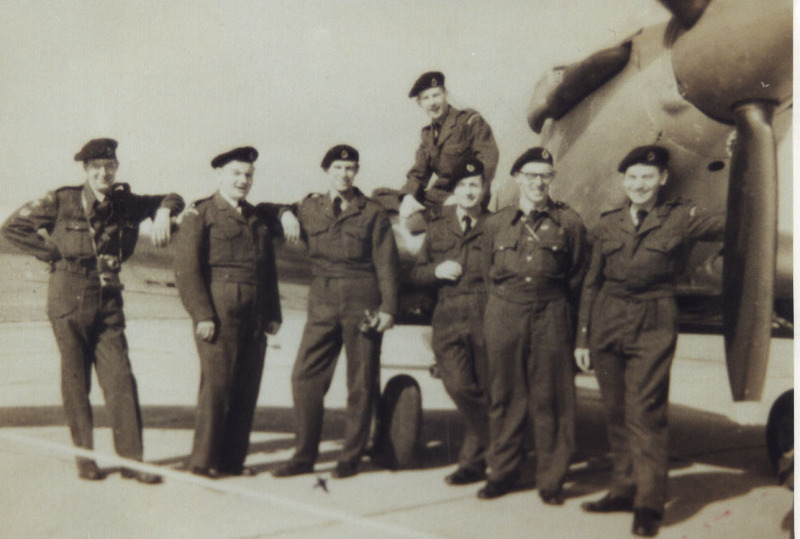 Most of the people manning Billericay post were ex-RAF, several of them real flying types. I was an ex employee of Air Staff Plans, RAF Changi, Singapore. The Papa 4 Contingent. From left, Jack Thornton, Ron Shrubshal, myself, the other four names lost in the mists of time. Later the M.O.D took over and brought with them governmental bureaucracy…..and the underground post. In that concrete “box” we had bunks , a pump in case the thing flooded, and various instruments both inside and on top which were supposed to read the results of a nuclear burst, including height of burst, strength and wind direction. This was in the height of the cold war and if the balloon had gone up we Observers were expected to leave our families and dash to the underground post and stay there until advised otherwise, which could have been weeks. I often wondered just how many Observers, if push came to shove, would have left their families, knowing they would be at risk of fallout or worse for the dubious safety of that underground post. Anyway, that is just a thumbnail sketch of the R.O.C at Billericay. Happy to supply further information should that be required. I can tell you that the second observer from the left is my father Reg Chambers. The entrance shaft sticks above ground as does what I believe is the periscope. Both shafts are capped and locked with padlocks. Wow that’s really interesting thank you. There does seem some confusion about the ROC post. Everyone identifies it to be in Great Burstead whereas there is an underground post just south of Little Burstead. Time seems to have moved it. The underground post was just off Rectory Road, Little Burstead. Opposite the entrance to St Mary the Virgin church on the other side of the S bend is a footpath towards Great Burstead, about 20 feet into the footpath the post is on the right behind a low fence. Many thanks. It there anything to see of it still? Where abouts in Great Burstead was the ROC post?